The Environmental Justice Team at Lone Star Legal Aid welcomes you to the second edition of Environmental Justice News. We’re keeping communities updated on our team’s ongoing environmental law efforts throughout our 72-county service area. 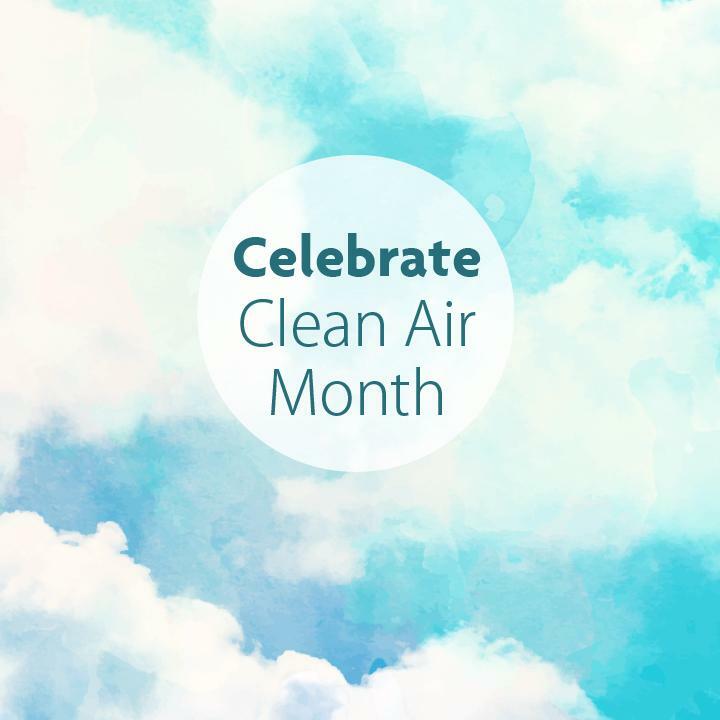 This month's newsletter features air quality issues the EJ team is helping communities tackle in LSLA's service area, including fine particulate pollution (PM2.5) in Houston's Acres Homes neighborhood and hazardous releases in Port Arthur after Hurricane Harvey. Later this week, we will feature an interview with Air Alliance Houston's Bakeyah Nelson, PhD - the first in a multi-part series on air pollution in our service area. Look for "What's in My Air?" coming up soon on the LSLA blog! “Siloing,” Ruby Glass began the discussion prior to LSLA’s community presentation one afternoon in late March. “It’s siloing happening here,” Glass emphasized. She described how fragmentation and polarization seemed to be fraying the social fabric of Acres Homes in recent years. And yet, what was revealed that afternoon was something very different from this dystopia. The small but highly dedicated group of residents and members of the Ferguson Street Area Civic Club showed up that afternoon united in a common purpose: to make a difference in their community. Fighting for their right to clean air, residents engaged LSLA EJ team members for an information sharing session on the public participation process for the state's environmental regulatory agency, Texas Commission for Environmental Quality (TCEQ). 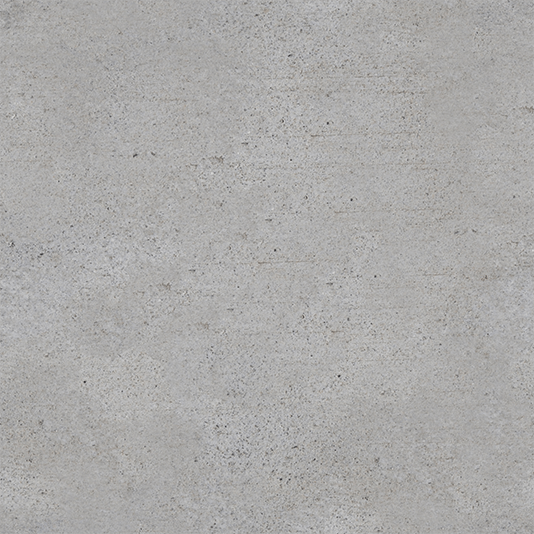 There were just a few days left in the window of time allotted to submit public comments on a new air permit application for a standard concrete batch plant . The batch plant, Soto Ready Mix, is currently proposing to locate its industrial operations directly across the street from Highland Park and Highland Community Center , where the civic club meeting was held that afternoon. Outside in the park, children played an after-school pickup game of basketball, while teens volleyed a tennis ball back and forth in the sunny breeze of the afternoon. Horses grazed in paddocks less than a block away. Across the street, dump trucks ominously moved around piles of sand at the batch plant site. A high fence surrounded the property line, and a small notice posted on the gate quietly displayed TCEQ’s permitting information. Concrete batch plants typically produce a large amount of dust , also known as fine particulate matter (PM2.5). PM2.5 can be inhaled deeply into the lungs and travel into the bloodstream, causing serious health problems. Exposure to PM2.5 is associated with an increased risk of asthma attacks, cardiac arrest and premature death. Exposure to PM2.5 from cement dust can also impair lung function, cause silicosis, and has been associated with lung, stomach and colon cancer. ﻿﻿TCEQ's public participation process is a critical time for community members to provide the crucial public feedback necessary to take action against industrial polluters operating in residential neighborhoods, particularly in cities like Houston, where a lack of zoning allows industry to move in. Providing outreach to communities facing this onslaught is just one part of LSLA's advocacy work on concrete batch plants, which includes drafting public comments to TCEQ, requesting public meetings and contested case hearings on behalf of clients, and representing clients and groups in those hearings. Keeping a watchful eye, the EJ team also alerts communities on new batch plant permit applications. A few days after the community meeting, members of the Ferguson Street Area Civic Club showed up to the TCEQ public meeting and made their voices heard. Approximately two hundred community members, including lifelong Acres Homes residents, civic club members, congregation members and pastors, small business owners, conservationists, and residents of neighboring communities all joined in opposition to the plant along with city, county, and state elected officials. Among the many impassioned speeches heard that evening, public comments addressed the serious health risks associated with particulate matter, many noting the close proximity of this industrial operation to the park and community center, as well as homes, churches and schools. Expressing strong opposition to the plant, the City of Houston's chief environmental scientist Loren Raun pointed out that the Acres Homes area already suffers twice the rate of cardiac arrest and 6 times the rate of ambulance-treated asthma attacks than the rest of Houston, based on the city's EMS data. Raun also shared recent research indicating that multiple concrete batch plants in this area have an additive effect on PM2.5 emissions, further increasing health risks. TCEQ denied the initial permit. The community was elated. Contacting LSLA’s Colin Cox shortly after TCEQ’s decision was handed down, Glass felt newly empowered to advocate for her community. Working towards this common goal has had a unifying effect on this historically under-served environmental justice neighborhood, Glass shared. In a letter addressed to Acres Homes residents, State Representative Jarvis Johnson commended the community’s efforts working together in unity towards a specific common goal. Yet, Johnson’s letter was underscored with caution, as he noted the company, which already owns the property, would probably reapply for a new permit. Just weeks later, Soto Ready Mix re-applied to TCEQ under a new permit number. The current air permit application for Soto Ready Mix on Homestead Road is under review at TCEQ. Once a notice on this permit application has been published in the newspaper, TCEQ will allow a 30-day window of time to submit public comments, request a public meeting, or request a contested case hearing on the current application. LSLA is available to assist eligible clients in drafting comments. We are also available for presenting to communities on how to challenge or comment on TCEQ air permit applications. To view or listen to previous public comments from the March 26th public meeting, you can search the TCEQ Commissioners' Integrated Database . Using Search One, Step One, choose "Open and Closed Items." Under Step Two, enter the TCEQ ID Number 149713. Under Step Three, choose "Include all correspondence from the public on this Item." Then click on "Search" to view and listen to comments. Beard’s deep commitment to community extends beyond his 30 years of civic engagement serving on city council and numerous community organizations over the years. Born 61 years ago in the historically segregated, low-income African American community of Port Arthur’s West Side where he still lives today, Beard has seen generations of families living in the shadow of industry. His parents grew up there in the late 1920's - 30's. “In those days, folks would spend evenings on the porch or in their gardens. My daddy used to tell me if you had a white house, you could go to bed, and the next morning you’d wake up to find the whole side of the house had turned yellow.” The family's white clapboard home stood just 50 feet from the billowing plumes of sulfur dioxide pouring night and day from the largest petroleum refinery in the U.S. (then Texaco, now Motiva). Still the largest petrochemical complex in the U.S., Motiva is just one of three major refineries and eight additional hazardous facilities engulfing the neighborhood. In 2015, an estimated 10, 212 tons of hazardous and carcinogenic air pollutants were released on Port Arthur residents by the three largest refineries alone. This figure does not include an additional 1,058 tons released during malfunctions of equipment and other unplanned releases that year. In fact, unplanned releases occur with troubling regularity in Texas, and can unleash more pollution in mere hours than an entire year’s worth of planned releases. The health effects are staggering. Cancer mortality among African Americans in Jefferson County is 40% higher than the rest of Texas. Children in Jefferson County suffer more than double the nation’s average asthma rates. According to EPA data, Port Arthur is burdened with some of the highest rates of cancer, heart, lung, and kidney disease in the state. No stranger to these statistics, Beard’s son lives with kidney disease. By any statistics, 2017 was far from an average year for Port Arthur, though. An environmental disaster of epic proportions unfolded when Hurricane Harvey, the worst rainfall event in U.S. history, unleashed 64 inches of rainfall on the area in late August. Seventy-four thousand homes in Jefferson County were flooded, with twenty-two thousand in Port Arthur reaching up to 6 feet of water. As the flooding continued to wreak havoc on homes, dozens of toxic releases occurred throughout the area after emergency shut-downs and hurricane-damaged storage tanks released an untold amount of hazardous pollutants into the air, land and water, endangering residents’ lives and health. Beard relies on this kind of experience-based knowledge in his work with PA-CAN. The group partnered with LSLA in September 2017 hosting disaster relief legal clinics. Following the clinics, Lone Star successfully advocated on PA-CAN’s behalf for the closure of a hurricane debris management site that left residents with a mountain of moldy, toxic refuse across the street from their doorsteps. LSLA has continued to advocate for the environmental health and safety of Port Arthur communities since then. Responding to residents’ concerns about land contamination, the EJ team has been investigating multiple Harvey-related discharges from area refineries like Motiva, as well as a gas station on 19 th Street where a suspected leak in underground storage tanks encroached onto residents’ properties, leaving an oily substance behind. LSLA’s advocates have filed multiple permitting challenges against Motiva and Valero facilities in an effort to reduce emissions and improve air quality. Additionally, the EDI team has been working on sewage and drainage issues affecting Port Arthur neighborhoods since the storm. While the lack of affordable housing post-Harvey has caused many residents to flee, the city is still waiting for processing of federal relief funds which would provide help for those who need it the most. In January 2018, the GLO stunningly left Port Arthur and Jefferson County out of Texas’ initial plan for allocation of Harvey Relief Funds. Although the area has been included in subsequent funding allotments, many residents are still awaiting relief. A public comment session is ongoing through May 31 st regarding the method of distribution (MOD) of funds for infrastructure and buyouts/acquisitions in Jefferson, Hardin and Orange Counties. Port Arthur stands to receive significant funds given the amount of devastation since Harvey, which gives Beard some hope for his community's recovery. Clarissa Ayala, Rebecca Novak and Amy Dinn contributed to this story. 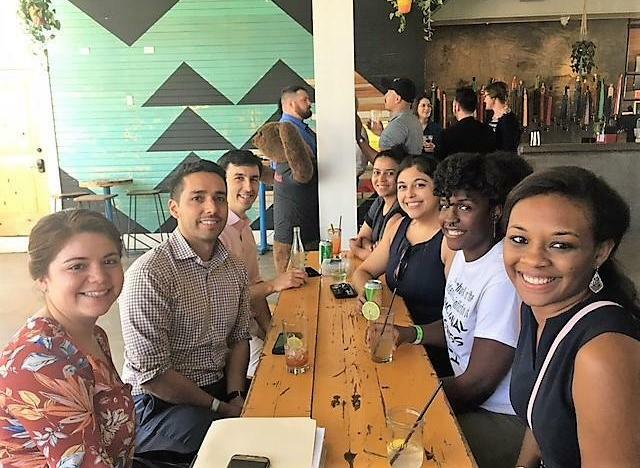 EJ team members recently held a meet and greet welcoming incoming Texas Southern University Thurgood Marshall School of Law externs. TSU rising 3Ls Christina House, Kristiana McGraw, Valerie Salcido and Reese Selman will join the EJ team for Summer 2018 externships, while four additional TSU students will complete their externships in Fall 2018. Collectively, the TSU group possesses an incredibly wide range of experience, skills and knowledge. Externs will contribute directly to LSLA’s work while receiving school credit and gaining an in-depth experience in the practice of environmental law. Incoming externs will carry out a project analyzing current Environmental Justice programs across 50 states in the United States. They will also conduct field work in environmental justice communities alongside EJ team members tackling air quality, water quality, land contamination and civil rights issues in LSLA’s service area. 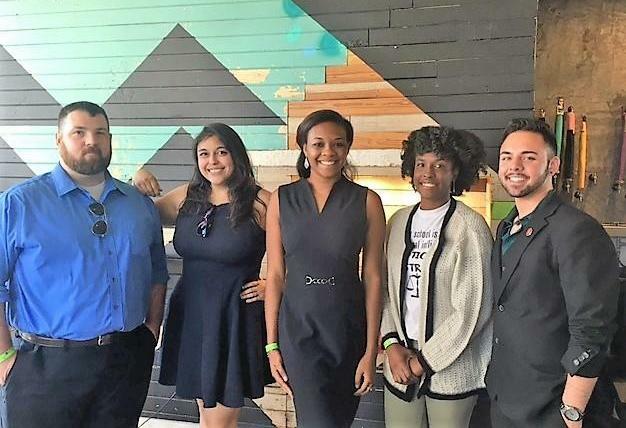 LSLA first rolled out the TSU externship program in Fall 2017 when recent TSU graduate Ren Young joined the LSLA Equitable Development Initiative team just after Hurricane Harvey dumped more than 60 inches of rain over some areas of the region. Funded by the Houston Endowment, the externship program has been crucial to the team’s work post-disaster. Young helped the EDI team process a massive surge of Harvey-related housing problems affecting thousands of individuals across the LSLA service area. 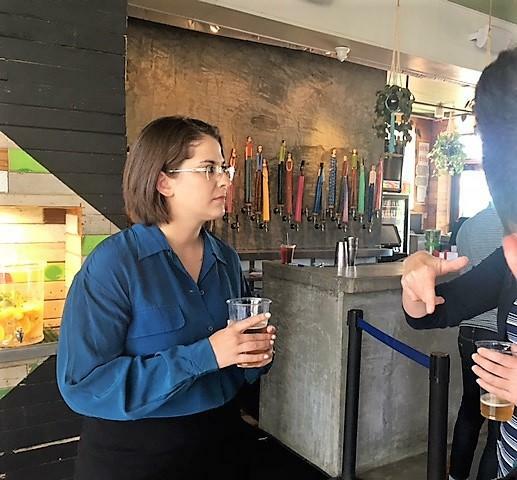 The next wave of issues, explained Young at the recent meet and greet, came when dozens of Debris Maintenance Sites (DMS) began materializing throughout impacted areas. Researching the site locations, Young found that the moldy, toxic post-storm debris was being disproportionately dumped onto minority communities like Port Arthur’s West side. Armed with this information, the EJ team was able to advocate to the City of Port Arthur to shut down a site directly across the street from a predominantly African American neighborhood.